Schneider-Kreuznach industrial filters are high performance technical filters that have been adapted to the requirement of industrial users in research, engineering and production. 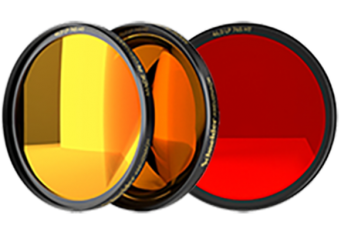 These filters feature improved optical quality, are provided with detailed technical parameters, and have passed a strict quality assurance process. Schneider-Kreuznach has the capability for coating and mechanic design and production, giving the advantage of providing customized filters. A µ micro water jet enables to cut each thinkable shape.